Who knew landing pages and cake had so much in common? Image via Shutterstock. 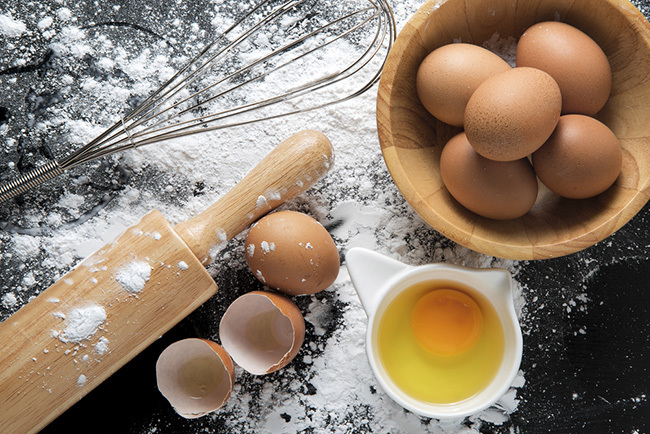 In some ways, building a landing page is like baking a cake. Certain people prefer chocolate, and others like cream fillings, but there are some fundamental formulas (for both cakes and landing pages) that are tried and tested, and proven to produce positive results. This post is a recipe for a solid vanilla sponge landing page. For advice on design (a.k.a. the buttercream frosting), check out these posts on user experience and essential design principles. Want to test the formulas out for yourself? 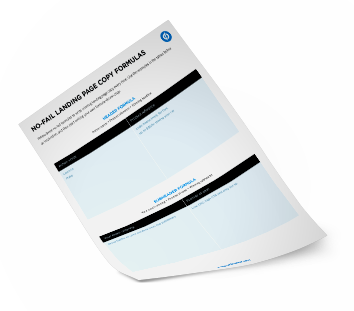 Download our FREE worksheet for creating no-fail landing page copy. To hell with suspense. Readers should have such complete understanding of what is going on, where and why, that they could finish the story themselves, should cockroaches eat the last few pages. In the same way that active voice makes a sentence stronger by shifting focus onto the subject, active words help to promote action and create urgency. Active words in headers are usually verbs like build, get, launch, unlock, pledge, invest and give. 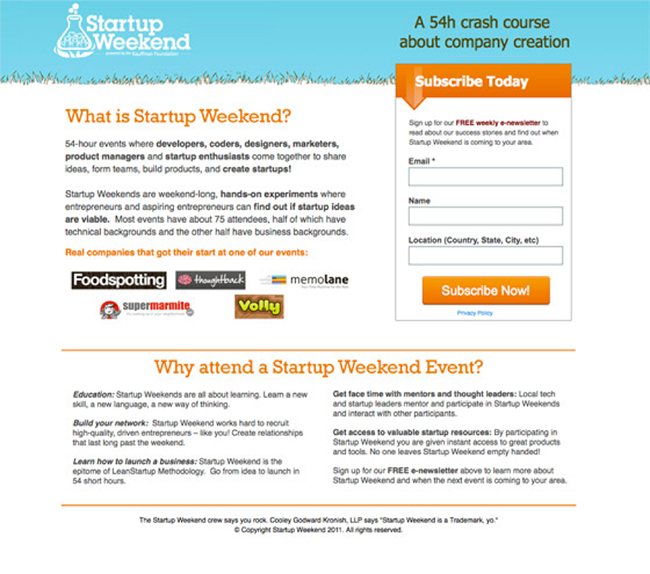 Here are a few examples of effective, action-led landing page headlines. 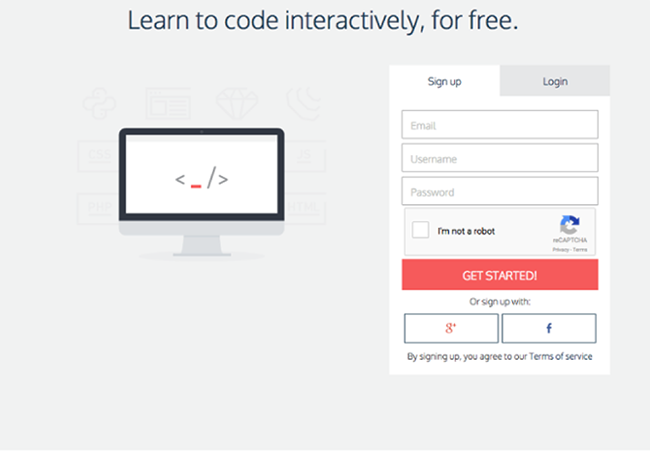 Codecademy’s headline is about as close to perfect as it gets. 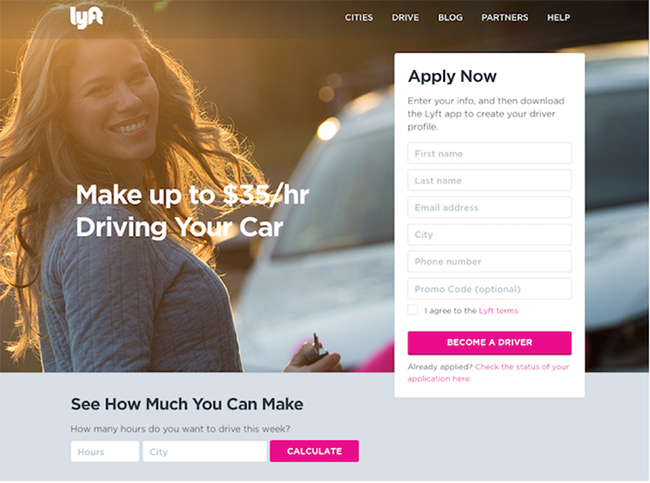 Lyft doesn’t use the “Get started” CTA we’ll talk about, but that headline is a winner. Pro tip: To maximize your conversion efforts, ensure there’s message match between your click-through ad and headline. Your header is an active statement, introducing your product. Your subheader is the second wave, there to support the header and give visitors a reason to continue reading. In the subheader, you tell your audience exactly what you have to offer, and highlight how incredibly easy the whole process will be. Online, all it takes is a few taps and a few clicks to make a potentially big decision, but if it’s not easy, a lot of us won’t bother doing it. That’s especially true of a landing page, which is essentially a 24/7 elevator pitch for your business. Header: Introduces the idea or service in an active way (inspire your audience to do something). Subheader: Backs up the header by giving a reason for your visitor to read on. Ooo, easy setup — just what we all love to see. This example from Outbrain might not have the prettiest header or subheader, but both illustrate exactly what we’ve been talking about. The header is active, and so is the subheader, which tells you exactly what the main benefits of using Outbrain are, along with the promise of an easy setup. The bulk of your landing page copy does the same job as the header and the subheader: it presents the benefits of your product to the user, and encourages them to act. It’s tempting to go off-piste in the body content, to talk about your values and how you donate half of your profits to charity, but hold off. You need to make sure that your product is one your audience wants first. Stick to the benefits, and expand on those. You’ll probably have more than one point to make on your landing page, but even if you don’t, breaking content up with headers and bullet points increases the chances of something catching your reader’s eye. It’s the equivalent of a supermarket arranging its products into categories and shelves, rather than bundling everything together in a big bargain bin. With your body content, just like with your subheader, focus on what you have to offer, why it’s better than the competition’s and how you’ll do most of the heavy lifting should your prospect hand over their valuable email address. Let’s take a look at how MuleSoft connects header, subheader and body content. The header: In this case, the header is just what the product is, which is likely the most appropriate approach for this audience. The subheader: The subheader — or supporting header — focuses on the main benefit of the handbook. 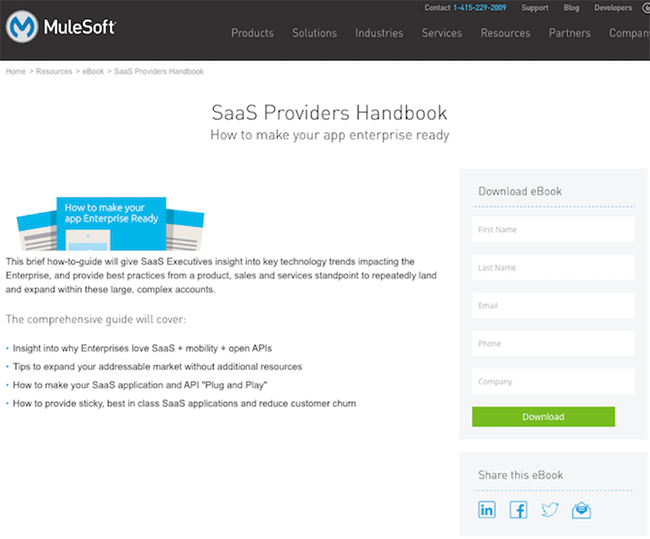 Clearly, MuleSoft knows its audience, and is giving it to them straight. The body: It’s still laser-focused on those main benefits, giving visitors ample opportunity to become engaged. What does your product do, and how does it make your prospect’s life easier? What are your product’s most ground-breaking or useful features? Who does your product help? How easy it is to get started? Who else uses your product? Since we’re talking about no-fail copy, like blueprints for you to riff from, we’ll tell you straight up that the most common call to action phrase that makes it to live landing pages, is “Get started”. That’s followed closely by anything with the word “get” in it. Why does ‘Get started’ work? It needs to be clear that your call to action is where the next step happens. If you want serious leads, then the call to action button is not the place to test out your funniest one-liners. Just like the header and subheader, the call to action is active, it’s job is to create momentum. Pro-tip: Best practices are best practices for a reason, but don’t use a “Get” CTA just because I suggested it. Do some research, craft a sound hypothesis and A/B test your button copy for maximum conversions. FluidSurveys‘s button copy is active and timely. Cheezburger pairs tried and true button copy with another one of our favorite words: free. 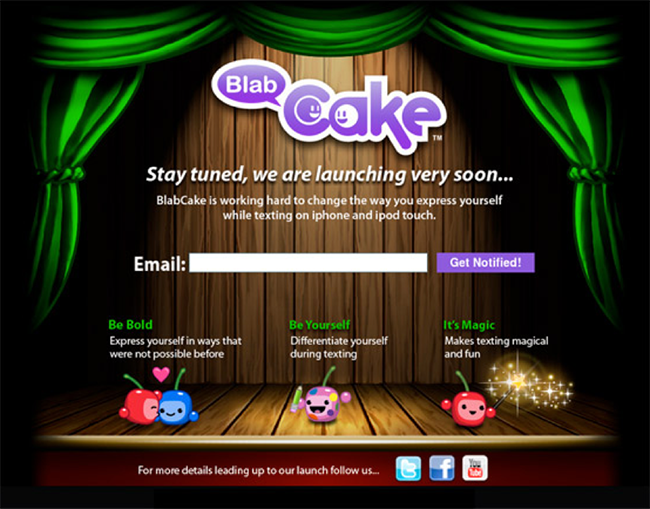 BlabCake uses a slightly different version of the “Get” formula for their coming soon page. What you’ve got in these formulas, is the recipe for a basic vanilla sponge — the foundations of a successful landing page. Put them together and then — like any good marketer — your job becomes testing that landing page to see what works best for your audience. What are your favorite copywriting formulas? Share ’em in the comments!